EASYTILER is an effective system for evenly laid porcelain tiles, stone or marble. Do it yourself! Evenly laid tiles with less effort and in shorter time. For professionals and DIY craftsmen. EasyTiler clip: Put it underneath the tile and it becomes middle part between two tiles. It is used only once. After the tile adhesive is dry, lower parts stay hidden underneath the tile, upper part is detached. 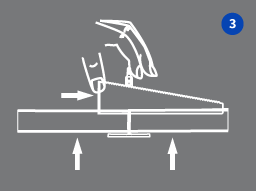 EasyTiler wedge: Enables that two tiles stay evenly laid until tile adhesive is completely dry. Leveling pliers: for laying bigger surfaces of tiles. 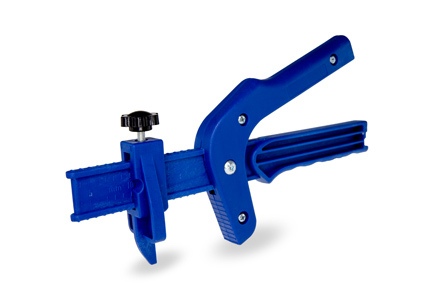 Adjustable by the tightening level and for different thicknesses. Two types of pliers: for levelling tiles on floor and on walls. An effective system for levelling tiles. Evenly laid tiles with less effort and in shorter time. Especially useful when laying tiles of bigger dimensions. 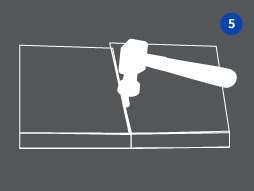 Because of unique clip design it is the perfect system to use with tiles of different thicknesses. Simple detaching system: No special removal tool is needed. Spread the adhesive. Adjust the clip under the tile. Carefully and tightly insert the wedge into the clip slot. Tiles are now levelled in height. 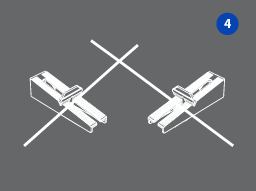 Because of unique clip design it is the perfect system to use with tiles of different thicknesses. Set the clips and wedges on all four sides of each tile. When laying bigger tiles use two clips on every side of the tile. 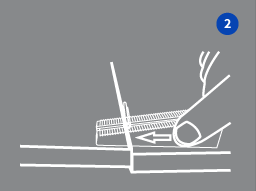 Use gumhammer to detach the wedge from the tile by striking it perpendicular on the clip. Clip breaks into two pieces, wedge can be used again. 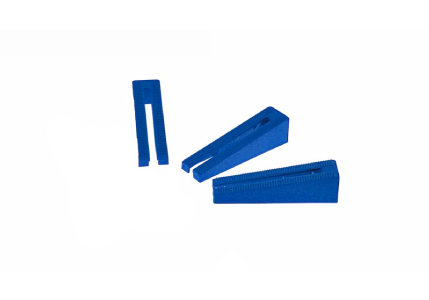 Recommended number of pieces of EasyTiler clips and wedges for various dimensions of tiles per square meter. For evenly laid porcelain tiles, stone or marble. 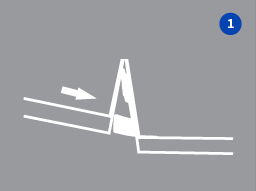 Joint thickness: 1, 5 mm. Buy this 200-pieces set additionally after you use up all the clips from the basic set. Higher clip is especially suitable for stone and marble. Joint thickness: 1, 5 mm. Buy this 200-pieces set additionally after you use up all the clips from the basic set. 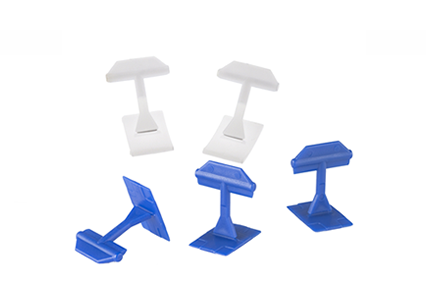 Blue, 3 mm clip has all the qualities of regular clips, however it is used for achieving a wider joint. Joint thickness: 3 mm. Buy this 200-pieces set additionally after you use up all the clips from the basic set. Wedges are reusable. Buy them additionally if your surface of tiles is bigger and wedges in the bucket are not enough. When using tiles dimensions 50 x 50 cm this set covers the surface of 12 m2. It is packed in a 12-litre bucket, where wedges and unused clips can be saved for the next time. Even faster and easier tiling for bigger surfaces. Because I got a very challenging tiling project I needed a tiling system and I found the Easytiler-system. It is a great idea to insure the stability of the tiles and very simple and easy to work with. I believe that it is even perfect for the DIY-tilers to make a professional result. Even though I needed a lot of the clips, I was very pleased to work with Easytiler, because it helped me to get a perfect surface. With this first experiment of Easytiler – I am not going to tile without Easytiler anymore! Podjetje Status d.o.o. Metlika je zaznalo priložnost vstopa na avstrijski trg z izdelki EasyTiler (sistem za ravno polaganje ploščic), zato smo se odločili za izdelavo tržne raziskave. Cilj raziskave je ugotoviti, kakšen je potencial izdelka in prodaje, kateri so pravi prodajni kanali in identificirati kupce. Končni rezultat bo nabor potencialnih kupcev in načrt, kako uspešno vstopiti na avstrijski trg. Naložbo sofinancirata Republika Slovenija in Evropska unija iz Kohezijskega sklada. Več informacij na www.eu-skladi.si.